Comments: American beavers are the largest rodents in Kansas. They use trees, other vegetation, and mud to build dams and sometimes their dome-shaped lodges. 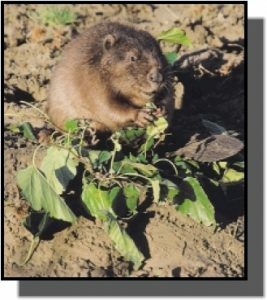 Most Kansas beavers live in bank burrows along streams and rivers. Beavers have large, orange incisor teeth and strong jaws. They have large, webbed hind feet, a horizontally flattened, scaly tail and coarse brown fur covering gray silky under-fur. Beavers are active throughout the year from dusk to dawn. In the twilight hours, they may be observed swimming, their head causing a triangle-shaped wake on the surface of the water. Females bear a litter of 3-4 kits in May or June. They may live up to 15 years in the wild. Distribution: American beavers are found in aquatic habitats from northern Mexico to Alaska. They are found in Kansas wherever there is water and a source of edible trees. Food: Beavers feed on rhizomes, roots, and shoots of aquatic plants and leaves and twigs of trees in warm months. They cache tree branches underwater next to their den site in winter allowing them to access their food even during ice cover. For more information, see the GPNC American Beaver Portrait.